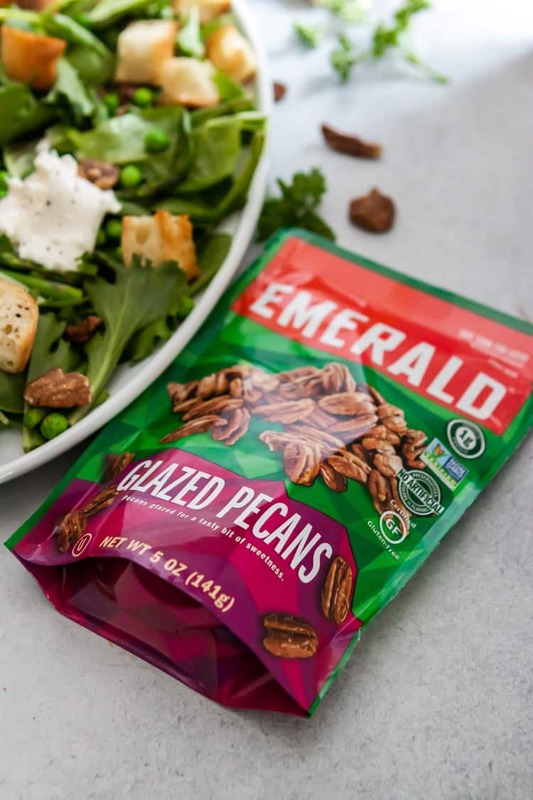 Save $1 on One or $2 on Two EmeraldGlazed Nuts Now! Spring is here! And with the onset of spring comes all of my cravings for big and beautiful salads! I swear the second the weather warms up, my body tells me no more soup and no more cozy comfort foods. It’s begging for all the light and refreshing goodness of gorgeous greens. But don’t get me wrong, I am not the kind of salad girl that is content with a plate of just greens. I am the kind of salad person who needs lots of crunch from freshly baked croutons, a good amount of cheese and always always ALWAYS pecans. Ok, not always but pretty darn often. We also love walnuts, almonds, pistachios—nuts in general. We like our salads with a good amount of crunch. 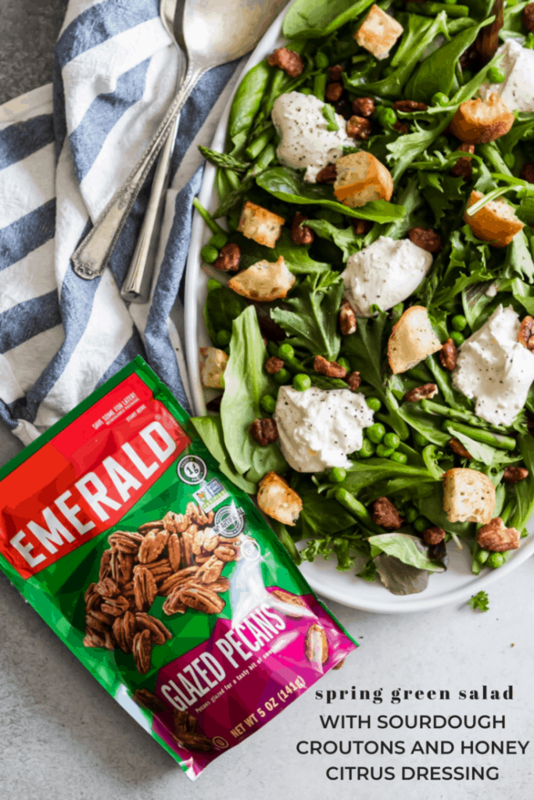 So today, we are adding one of our favorites—Emerald Nuts—into this delicious, hearty and satisfying salad that is gonna be the perfect complement to all of your spring meals. I love a little bit of sweet combined with a little bit of savory. 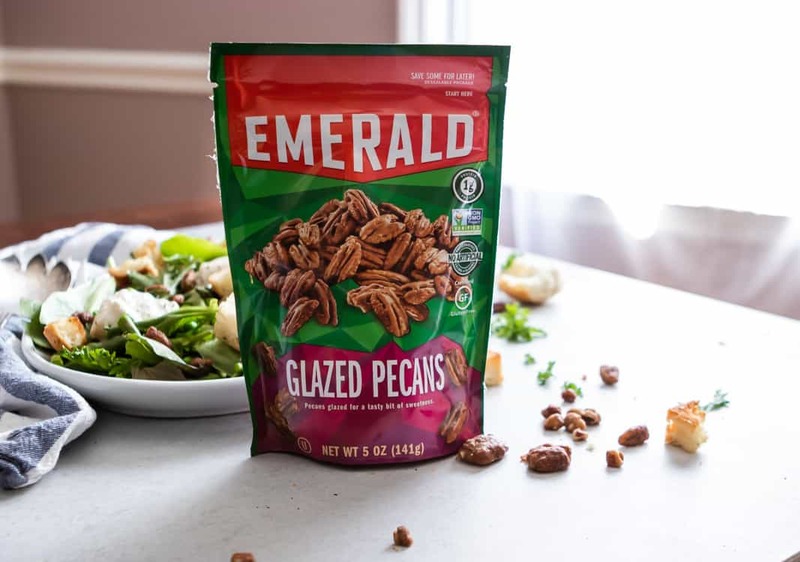 So imagine what these sweet, crunchy Emerald® Glazed Pecans do to a salad like this one! 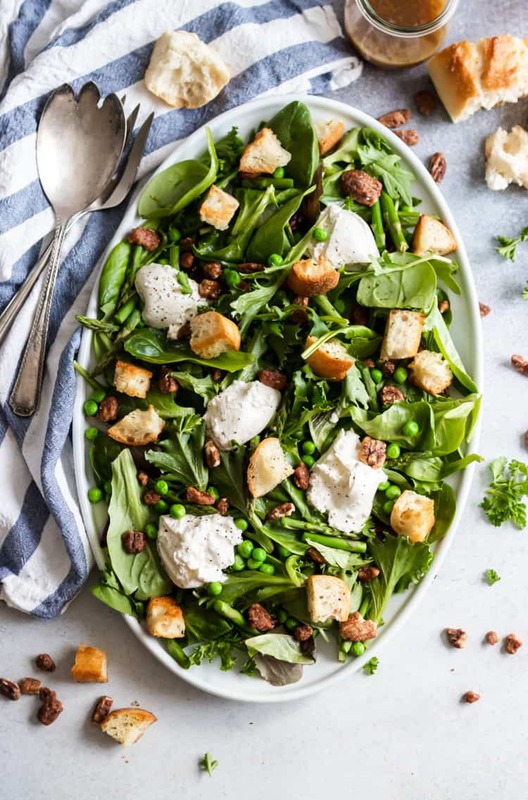 Capitalizing on some spring produce with this Spring Green Salad, including a spring mix, perfectly in-season asparagus and my personal favorite: spring peas. Anthony will not touch a pea to save his life so he is just gonna have to learn to pick them out for this one, I think. Too pretty not to add them! What’s even better about seasonal produce is that you can generally get it at better prices than any other time of year. So a big bunch of asparagus will cost you much less this time of year. I am up for a salad that saves me some money, too! 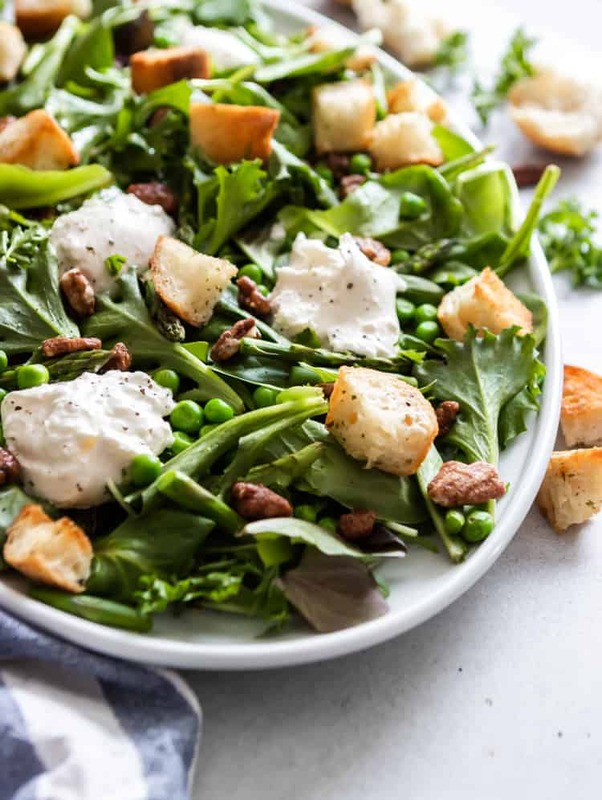 The combination of the veggies, burrata cheese, honey citrus dressing, fresh croutons and Emerald glazed pecans is honestly salad perfection. Now, just be warned, you will want to grab some extra glazed pecans like I did. That is because you most certainly will sprinkle them on the salad and snack on them at the same time. Think I am wrong? I am NOT. These delicious and flavorful sweet pecans are a snacker’s dream just as much as a salad maker’s dream. Don’t say I didn’t warn you! Burrata can be hard to find sometimes. I only have a couple stores near me that sell it. It can be a touch pricy as well. Use mozzarella instead if you would like! It will still be super tasty. Make this salad a meal by adding some freshly grilled chicken or salmon. That’s what we did the first time I made this, and it was a delicious dinner! Easily make this recipe gluten free by using a gluten-free bread to make the croutons. The glazed pecans are gluten free, so no need to worry about them! 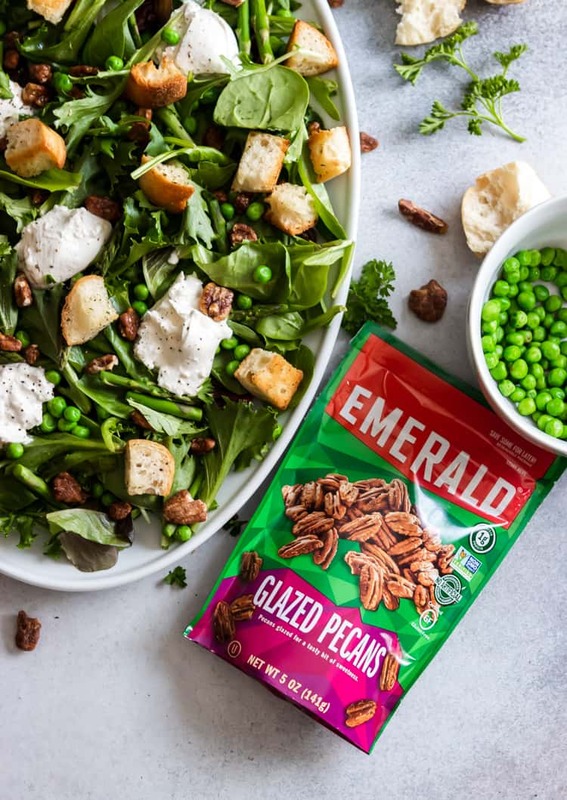 Save $1 on one or $2 on two now on Emerald Glazed Pecans using this coupon, and create your own incredible salad this spring! Rinse and trim asparagus. Toss with a small drizzle of olive oil, and a dash of garlic, sea salt and pepper. Line on one half of the pan with parchment. 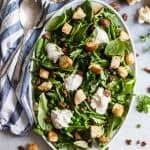 In a bowl, toss all ingredients for croutons together and coat bread well. Line evenly on other half of baking sheet. Bake for approximately 12 minutes. If you like your croutons extra crispy, allow them to stay in a couple extra minutes. Remove and allow to cool. While asparagus and croutons are baking, whisk all ingredients for the dressing together well. Add sea salt to taste. Chill until ready to serve. Cut asparagus into 2 inch length pieces. 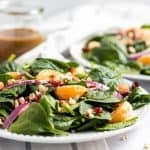 Add spring mix, peas, and asparagus into a large salad bowl or serving platter. Just prior to serving, add Burrata (You can break into it and cut up or throw it on whole and then break them up as you serve. ), croutons, and glazed pecans. 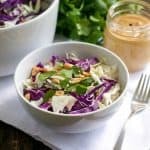 Toss with desired amount of dressing and enjoy!